A point-by-point breakdown of the Progressive Conservatives' job plan, which was spelled out in more detail on Tuesday by Leader Tim Hudak. 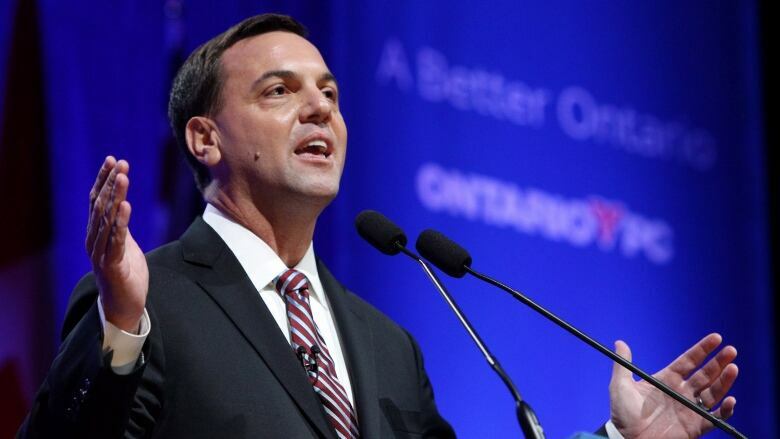 Ontario Progressive Conservative Leader Tim Hudak has promised to help create about 1,000,000 jobs over eight years if he wins the June 12 election. Hudak's plan acknowledges that more than 523,000 jobs would be created anyway if the government simply continued the policies of the last decade. Here's how he plans to do it with the PC's projected numbers of the jobs each proposal would create. According to Hudak's campaign website, full details of the jobs plan are still to come. Eliminate 100,000 jobs in public sector over four years, then hold public sector spending in line with population growth for the following four years. Projected job gain: 43,184 jobs. Abolish the College of Trades and eliminate restrictions on the skilled trades. Projected job gain:170,240 jobs. Reduce corporate taxes to 8 per cent, down from the current 11.5 per cent. Projected job gain: 119,808 jobs. Reduce personal income tax by 10 per cent after the budget is balanced in 2016-17. Projected job gain: 47,080jobs. downtown. Expand major highways and GO Transit. Projected job gain: 96,000 jobs. Lower energy prices by cutting bureaucracy at Hydro One and Ontario Power Generation; end subsidies for wind and solar power and reduce the number of provincial electricity agencies. Projected job gain: 40,384 jobs. Cut regulations on business, such as so-called "eco-fees" for recycling. Projected job gain: 84,800 jobs. Develop the Ring of Fire in northern Ontario. Projected job gain: 4,400 jobs. Participate in free trade agreement with British Columbia, Alberta and Saskatchewan. Projected job gain 1,592 jobs.